Since the mother is the one whose body carries a pregnancy, many suspected causes of miscarriage have to do with factors present in the mother. The father's role, or more specifically his sperm, has often been overlooked in the past. However, there may be cases where sperm quality can affect a pregnancy and even be responsible for a miscarriage. It's important to keep in mind that quite often there is no obvious explanation for a miscarriage. The American Society for Reproductive Medicine (ASRM) notes that fewer than half of all miscarriages in the United States have an identifiable cause. This can be frustrating, especially if you have experienced multiple miscarriages. The ASRM goes on to state, however, that two-thirds of women who experience recurring pregnancy loss go on to have a healthy pregnancy. In the past, most of the attention has focused on women. Only recently have studies have looked specifically at men and the association that sperm quality has on a successful pregnancy. Fertility experts agree that more research is needed, but more is known today than ever before. From abnormal chromosomes to sperm DNA fragmentation, even lifestyle choices, there are many ways that sperm can affect the outcome of a pregnancy. It is recommended that when miscarriages occur, especially multiple times, that testing focus on the father as well as the mother. The leading causes of miscarriage are chromosome problems. Chromosomes are blocks of DNA that encode all the information needed during development. Because half of a developing baby's chromosomes come from the father, it is possible that he may contribute abnormal chromosomes to a pregnancy. About 3 of 4 miscarriages occur during the first trimester of pregnancy. Typically, if a woman has a miscarriage during the first trimester, there was a problem with the baby's chromosomes. With chromosomal problems, something goes awry during conception and an embryo gets the wrong number of chromosomes (too many or too few). This may eventually result in miscarriage. Not all babies with the wrong number of chromosomes are miscarried, though. For example, babies with trisomy 21 have Down's syndrome. In the past, researchers have focused on the egg as the main source of chromosome problems. One reason is that (usually) only one egg is ovulated each menstrual cycle. With sperm, natural selection takes place before fertilization that theoretically should lead to the "fittest" being the ones to reach the egg. Additionally, genetic studies on tissue from miscarriages have traced errors in the first stage of maternal meiosis (early development of the egg) as being the most likely source of the abnormalities that cause miscarriages. But some research over the past decade suggests that this might not always be the case. Some cases of recurrent miscarriages seem to involve the father having a high incidence of abnormal chromosomes in his sperm. There aren't any real estimates for how frequently the sperm is a factor in recurrent miscarriages, and chromosome problems in sperm aren't believed to be a major cause of repeat losses. It does seem to be a possibility—especially in men whose sperm showed abnormal morphology or other markers of low fertility. 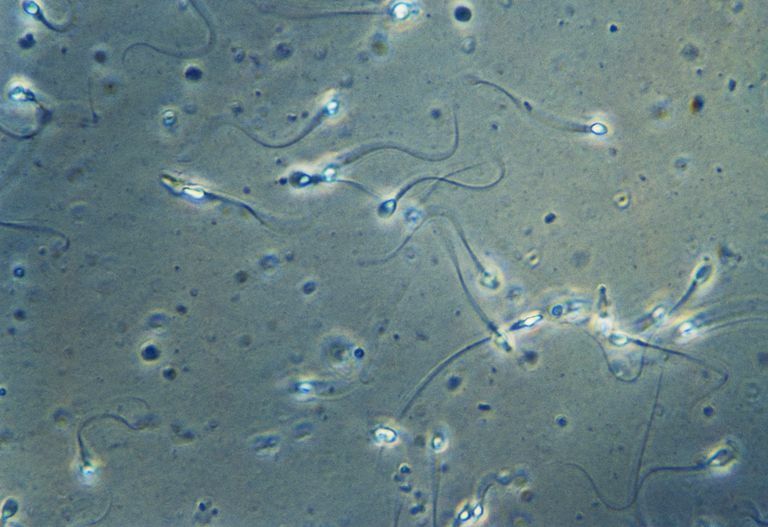 One of the keys to sperm quality lies in the DNA, which can become damaged. When this damage occurs, it is called sperm DNA fragmentation (SDF) and this is an area of focus for many research studies that are looking into the causes of miscarriage. SDF can occur for any number of reasons. Among these are cell death, environmental toxins, and illness or fever. Sperm cannot repair cell damage like other cells in the body and this is a leading cause of male infertility. The damage also affects the DNA structure within the sperm and if it fertilizes an egg, this can potentially lead to miscarriage. One study compared couples who experienced multiple miscarriages to couples with infertile men and fertile men. The result is that the sperm involved in the miscarriages was more likely to have signs of fragmentation at nearly the same rate as that of the infertile men. These sorts of results suggest that the correlation between SDF and fertility—both the inability to conceive and miscarriages—can be a factor. However, researchers are cautious to note that SDF alone cannot predict a couple's risk of miscarriage. When a woman becomes pregnant, the importance of her lifestyle choices is often stressed to encourage a healthy pregnancy and baby. It seems that a man's lifestyle may play a role as well. Just as a woman's health before pregnancy is important, so too is the man's. This primarily goes back to the effect on sperm quality. Things like smoking, drug and alcohol use, nutrition, weight, and exercise can all affect the health of a man's sperm. Unhealthy choices can lead to the many factors that decrease the chances of a successful pregnancy. This includes decreased sperm mobility and vitality, lower sperm counts, and abnormal morphology (the size and shape of sperm). It can also lead to physical damage. Any damage to sperm can cause fertility problems and, if an egg is fertilized, it may also lead to a miscarriage. Some physicians may recommend that men undergo tests for sperm quality when no other cause for recurrent miscarriages is found. The standard test is a sperm analysis, which looks at the shape, mobility, and sperm count in the sample. There are also a few sperm DNA tests available that go beyond the visual examination. However, the ASRM notes that this is experimental at best and not yet a reliable predictor of a couple's ability to conceive or the probability of a miscarriage. Sperm quality can sometimes, but not always, be improved with lifestyle changes or medications. Ultimately, many people who have miscarriages will never know exactly the reason why it happened. Several factors contribute to the risk of miscarriage and it's not fully known how big of a factor sperm is in that. While you may be looking for answers, your best option is to consult your doctor or a fertility specialist. American Society for Reproductive Medicine. Treatment of Recurrent Pregnancy Loss. ReproductiveFacts. org. 2014. American Society for Reproductive Medicine. Sperm DNA Integrity Testing: What Is It?. ReproductiveFacts. org. 2015. Carlini T, et al. Sperm DNA Fragmentation in Italian Couples With Recurrent Pregnancy Loss. Reproductive BioMedicine Online. 2017:34(1):58–65. doi: https://doi.org/10.1016/j.rbmo.2016.09.014. Kavitha P, Suttur SM. Positive Association of Sperm Dysfunction in the Pathogenesis of Recurrent Pregnancy Loss. Journal of Clinical and Diagnostic Research. 2014;8(11):OC07–OC10. doi: http://dx.doi.org/10.7860/. Kirkman-Brown J, De Jonge C. Sperm DNA Fragmentation in Miscarriage—A Promising Diagnostic or a Test Too Far? Reproductive BioMedicine Online. 2017;3(1):3–4. doi: https://doi.org/10.1016/j.rbmo.2016.12.002.